SAN ANTONIO - Both people were upset and visibly crying, according to an eyewitness. On Jan. 3, Christopher Davila and Beatrice Sampayo were seen by a witness in the driveway of their San Antonio home, besides themselves -- and understandably so. Davila's 8-month old son, King Jay Davila, was dead. 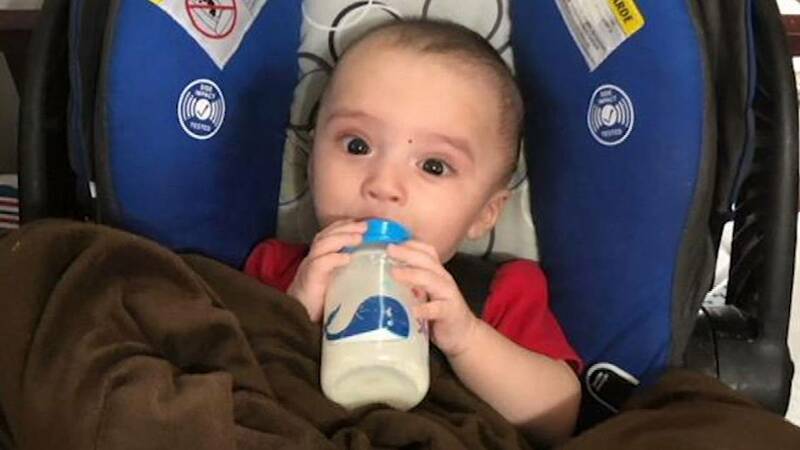 The story from Christopher Davila to police was that King Jay was sitting in a car seat on his bed while Christopher Davila was playing video games, according to an affidavit. King Jay was not strapped in, and when Davila said he sat on the bed, the car seat fell to the floor, causing King Jay to land face-first -- and possibly hit his head on the dresser. Even though a large bump started to form on King Jay, Davila said he was afraid to call 911, according to the affidavit. When Davila checked in later on King Jay, he was dead, the affidavit said. As startling as that was, it got even more so, with what ensued next. On Jan. 4, Davila drove to the Friend's Food Mart on the city's West Side. The store is less than a mile away from where Sampayo, King Jay's grandmother, lives, in the 400 block of Parkside Drive. At the store, Davila left his car running and the driver's side door unlocked while he went inside to buy a water and lottery tickets, police Chief William McManus said. During that time, Davila's cousin, Angie Torres, was seen on surveillance footage getting into the car and driving away with what police believed was King Jay in the back seat. Davila then called King Jay's mother, Jasmine Gonzales, who told him to get off the phone and call the police. Torres was later seen on surveillance carrying a car seat. McManus later said investigators determined King Jay was not in the car or in the car seat at that time, ruling the event a staged kidnapping by Davila. "This was not a car theft. This was not a kidnapping. This was a staged event," McManus said earlier this week. On Wednesday, Torres, 45, told police she went to Sampayo's home the night of the "staged kidnapping" and Sampayo told her that Davila "severely injured" his son, King Jay, according to the affidavit. After the alleged staged kidnapping, Torres said she was picked up by Sampayo, 65, at Rodriguez Park and disposed of the car seat as Davila instructed her to do. A police detective said surveillance footage confirms Torres' statement, which shows Sampayo and Torres arriving at a donation collection shed on South Acme Street. The video shows Sampayo and Torres driving away after placing a car seat next to the donation shed. A minute later, the video shows Sampayo and Torres returning to the donation shed and picking up the car seat, the affidavit said. A police officer later found King Jay's car seat three blocks away from the donation shed, near the intersection of Guthrie Street and Southwest 41st Street. Shortly after the alleged staged kidnapping, Davila, 34, was charged with child endangerment. Several days later, Torres was arrested on an unrelated aggravated robbery charge. But where was King Jay? This was the big question the entire community was wondering and praying over, and on Friday, the cold reality of where he was came to light. On Friday, police in San Antonio found King Jay's body after Davila took investigators to an open field near his neighborhood, authorities said. Authorities were led to a location less than a mile from Davila’s last known address, where they dug up a black backpack with what appeared to be the baby’s body wrapped in a blanket, according to an arrest affidavit. "(It's a) sad day for everybody," said Christopher Combs, special agent in charge of the FBI office in San Antonio. Davila is now facing felony charges of injury to a child causing serious bodily injury -- omission, tampering with evidence, felony possession of a firearm and possession with the intent to deliver a controlled substance. He could be charged with capital murder, pending an autopsy, which will be conducted soon. Sampayo and Torres both face a charge of tampering with evidence, which is a third-degree felony. "We're now working a death investigation, (and we) won't be finished until we find out how exactly how he died," McManus said.